Andrew graduated from Union University with a B.S. in Political Science and commissioned as an Armor officer in the United States Army in January of 2009. He served as a Cavalry Platoon Leader, Troop Executive Officer with 3rd BDE, 25th Infantry Division at Schofield Barracks, HI. Andrew also served one tour in support of Operation Enduring Freedom. After attending the Maneuver Captains Career Course in Fort Benning, GA, Andrew served as Assistant Operations Officer with 3-73 CAV, 1st BDE, 82nd Airborne Division. 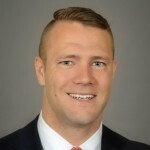 After leaving active-duty Andrew enrolled at Vanderbilt University’s Owen Graduate School of Management with concentrations in Operations, Finance & Strategy as part of Vanderbilt’s class of 2017.